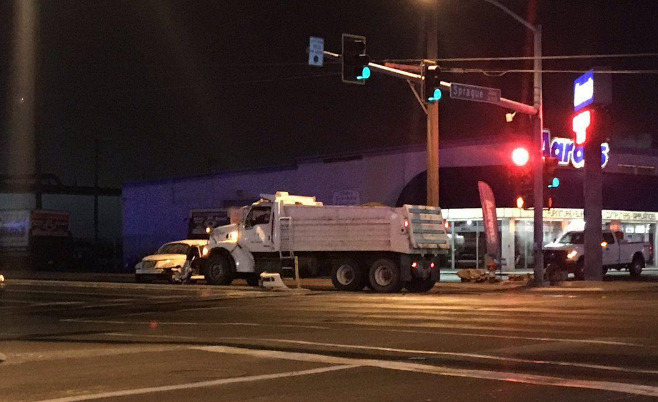 Spokane police temporarily closed the intersection of Sprague Avenue and Freya Street to investigate an early morning crash between a dump truck and car. The crossing remained closed during the morning commute Thursday morning, police said in a news release. The crash occurred about 1:30 a.m. between a City of Spokane dump truck and a PT Cruiser, KHQ reported. A passenger in the car was injured and transported to a local hospital in stable condition, police said. Published: Dec. 6, 2018, 6:16 a.m. Updated: Dec. 6, 2018, 4:58 p.m.